The VBUS LED indicates USB activity. 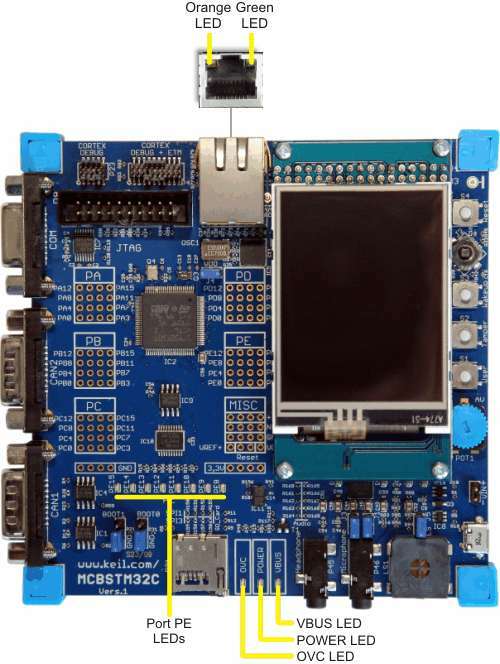 The POWER LED indicates that power is present on the board. The OVC LED indicates the 500mA USB output current limit has been exceeded. The 8 Port LEDs marked PE.8 - PE.15 connect to their respective port pins when jumper LED is installed. These LEDs are useful for indicating program status while testing your applications. The ORANGE LED (right/lower) on the Ethernet connector indicates LAN traffic is present. The GREEN LED (left/upper) on the Ethernet connector indicates a good link connection to the LAN.